Wholesale Healthy Snacks sold in 25 pound boxes. INGREDIENTS: SUNFLOWER SEEDS, PEANUTS (WITH PEANUT OIL, SALT), ALMONDS, RAISINS, GOLDEN RAISINS (RAISINS, SUNFLOWER OIL, SULFUR DIOXIDE (PRESERVATIVE), CASHEW PIECES, PUMPKIN SEEDS. 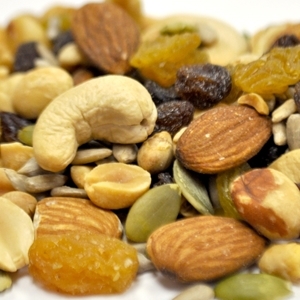 ALLERGEN INFORMATION: CONTAINS PEANUTS, CASHEWS, AND ALMONDS. CAUTION: MAY CONTAIN SHELL OR SHELL FRAGMENTS.